always on the lookout for the latest cookware which has been launched in the market. It comprises of cooking vessels like frying pans, griddle, deep fry pan, sauté pan, stew pot, cook n serve bowl and saucepans which are used either in the cooking range or on gas stoves. There are many manufacturers who are trying to bring out new range of cooking wares which will meet all the requirements of the people who are involved in churning out delicious and sumptuous food. There are some very good online stores which deal with the most reputed and authentic cookware ranges. The designers of this cooking aid have very diligently crafted such amazing variety which will indeed provide you with a delightful cooking experience. These reputed cookware designers create pots and pans which are crafted from heavy duty, commercial aluminum which is of 3.25 mm to 6.35 mm thickness so as to enable equal dispersion of heat and also for constant heat retention. Each piece of cooking item is made with the latest technology and it is given highly developed surface coating so that the cooking surface would be excellent. The handles used in the cookware are made from very fine materials like stainless steel, rosewood or high quality plastic so that the handles are robust, comfortable, stay cool and sturdy while using. The manufacturers who are producing the cookware are very particular about the quality of their products, they never ever compromise on the quality and use only the very best because they aware of their moral duty towards the society. Since food is prepared in theses pots and pans hence it is mandatory that the standard of the product is maintained, otherwise if you use cookware of low quality then the chances of food getting contaminated is very high. It is a known fact that food particles can undergo chemical reactions with the material of the container during the cooking process, so it is imperative that good material is used so that no adverse reaction takes place. The reputed companies involved in the production of cookware do quality control test of all their products before it is launched into the market. They ensure that in no manner it should have even an iota of defect and then each piece is packed individually so that during transit it does not get damaged. Most of the cookware have two types of cooking surfaces such as non-stick and hard anodized, so according to your choice you can choose the one which appeals to you the most. There is no doubt that it definitely enhances the appearance of your kitchen and also makes cooking an enjoyable experience. 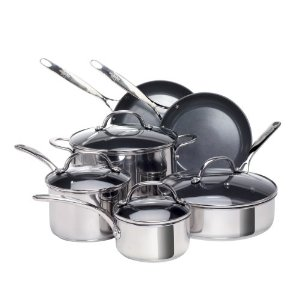 There is different cookware for the various purposes like sautéing, deep frying, roasting, stew making etc. There are many brands of cookware available in the market but it is always sensible to buy a reputed one because when you talk about cooking and food it is directly connected to your family’s health.